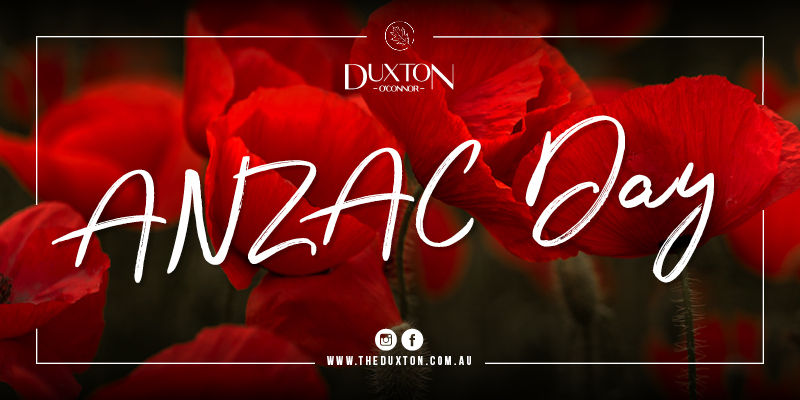 ANZAC Day this year at The Duxton in O’Connor will be bigger and better than ever! A day to commemorate and honour the members of the Australian and New Zealand Army Corps (ANZAC) and all brave military personnel who have and do serve our country. We will be raising much needed funds for Soldier On’s #forceforgood campaign, accepting donations on the day. Our doors will open from 6:00am for breakfast and throughout the day we will be serving our full menu and cold drinks from the bar. Try your luck with a fun game of Two-Up, running over two levels…downstairs in the main bistro and bar of The Duxton and upstairs in the Oak Room. Join us into the evening as the sun sets and grab all the sporting action from the traditional games of Collingwood V Essendon (AFL – 3:20pm), and the double header of Dragons V Roosters (NRL – 4:05pm) and Storm V Warriors (NRL – 7:50pm).